Dean of AUS Dr Dommalur Jayarangaiah presented the introductory speech to the group and encouraged the prospective physicians to be disciplined and studious, so that their goals may be realized. Dr Shakel Henson, senior lecturer at AUS, welcomed the students to the institution and to the beautiful gem of the Antilles, St Vincent and the Grenadines (SVG). She reiterated the need to remain committed to the field of medicine. Additionally, Dr Henson emphasized the significance of accumulating knowledge, as this better prepares physicians to efficiently and effectively manage and care for patients. The need to pay attention to the words of the Hippocratic Oath and to understand its relevance to medicine was stressed by the keynote speaker, pathologist Dr Ronald Child. He gave the students a vital lesson on the history of medicine, noting that knowledge of the past paves the way for better understanding of present day medicine. His inspirational speech asserted that âmedicine is not merely a science, but it is also an art.â He motivated the students to continue on the path of selflessly caring for others, which they have chosen. A memorable quote from his presentation was âlife is short, but the journey is long.â This reminded the students of the journey which lies ahead and highlighted the fact that a rewarding outcome requires discipline and hard work. These aspiring physicians were further inspired by a fellow student, president of the AUSâ Student Government Association, Gabriel Gyimah. He presented statistics that demonstrated a high demand for doctors and contributed to the positive responses that synergistically motivated students to continue and to succeed in this path of medicine that they had chosen. The event was witnessed by the Faculty and staff of AUS, senior students, family members, friends and well wishers. AUSâ Dean, Dr Dommalur Jayarangaiah, and the Campus Operations Manager, Syam SL, were pleased with the eveningâs event and vowed that AUSâ White Coat ceremonies in the future are likely to witness even more students entering its Medical programme. 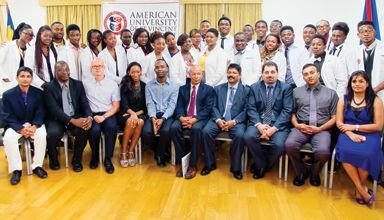 Last semester, AUS also donned twenty-six medical students in their first white coats. First established in 2012, the American University of St Vincent is a medical school which is located in New Montrose, St Vincent. AUS is registered and recognized by the National Accreditation Board of St. Vincent and the Grenadines.